Ready for a fun and slightly strange optical illusion today? Great! If anyone has one, let me know and I’ll post it. I’ll be over there—napping. There are actually a few oddities that you may have noticed when looking at this house optical illusion. The first thing that popped out to me was the window. Look into the window, and you’ll notice that there’s no back interior wall! The second thin I noticed were the slats on the building itself. They appear to be floating in mid-air above each other! And, when you look between the slats, it also appears that the building has no back interior wall. There can only be one cause of a building optical illusion like this. Can you guess what it is? The window isn’t actually a window at all; it’s actually a mirror. The same is true with every other slat on the side of the house as well. The reason it seems like the house has no rear wall and we can look right through it is that the mirrors are reflecting the desert around it. 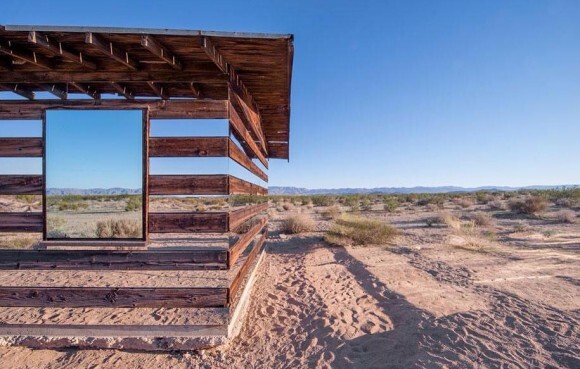 Did this desert house optical illusion fool you? Make sure you check out this Izabelin House illusion!